Last night, the Vegas Golden Knights got first-liner Reilly Smith back from a seven-game absence. During that time, Max Pacioretty and more recently Brandon Pirri, filled his spot on the top line. Upon his return, lineup changes needed to be made and in a surprising move, Gerard Gallant went off-script with a never before used forward lineup. Instead of simply replacing Pirri with Smith, Gallant chose to optimize his lineup. Pirri was moved from the top line with Jonathan Marchessault and William Karlsson to the third line with Cody Eakin. Ryan Carpenter, the usual third line right wing, was swapped out for Valentin Zykov, a more skilled offensive-forward. With the ability to use a proven scorer in Pirri on the third line, Gallant chose to use Zykov, the more dynamic forward, looking for more depth scoring. 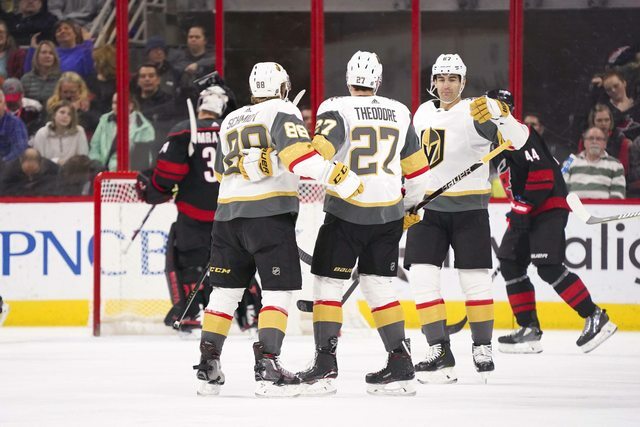 Whether these changes remain permanent or not is anyone's guess, but for one night, until the return of William Carrier, the Golden Knights rolled with an optimal lineup. Throughout the game against Carolina, the third line clearly looked like the best unit on the ice, playing in their first game as a trio. Zykov showed some jump, playing against one of the teams that recently waived him. Looking at the numbers supports that notion, as displayed by Natural Stat Trick below. Gallant's newest creation, the Eakin-Pirri-Zykov line, pushed play better than any other Golden Knight line at 5-on-5. In a game against Carolina, one of only two better play-driving teams than Vegas, it is impressive to "out Corsi" the opponent. Vegas' new third line succeeded to the tune of a 57.14% Corsi For %. The only other combo that outperformed the new unit, also included Zykov, who was playing in just his second game with the Golden Knights. Zykov was swapped with Smith, spending 2:24 on the top line. That temporary line registered a Corsi For % of 100%. When they were on the ice, they generated the only shots, shutting down their opposition with solid play driving. Despite the success of the Zykov lines, Carolina pushed play at much higher rate than Vegas. The Hurricanes showed why they are so high on the CF% ranks this season with a 56.8 percentage on the evening, against a Vegas team that is rarely out shot. A quick look at the Natural Stat Trick Gameflow Chart shows the extent and progression of Carolina's offensive push. Zykov's skillset has yet to translate in the NHL, but the usage from last night suggests big things on the horizon, for the forward who was waived twice this season. Expanding on the territorial battle, the Eakin line out-chanced their opposition at a solid clip, with a 6-2 edge in scoring chances and a 3-1 edge in high danger chances, when on the ice together. This is the type of production that will lead to goals, which Vegas has rarely had on their third line. The potential of more time together may help this line gel even more and the stats say they deserve that chance. It's no secret that Gallant loves using Carpenter, but Valentin Zykov certainly made a case for more usage and has a higher ceiling than #40. While Vegas played well in stretches, Carolina was able to get to AHL goaltender Maxime Lagace, for four goals on 31 shots. Lagace saw action, somewhat surprisingly, on the first game of a back-to-back against the better of the two teams. It is possible that the Golden Knights contingent felt comfortable with Lagace because they were coming off the mandatory break and he got game time in Chicago (AHL) in that week of inactivity. Another possibility is that they finally realized Marc-Andre Fleury needs less games. There have been multiple back-to-back sets this season where both games were started by Fleury, leaving Malcolm Subban on the bench. With Subban still out of the lineup, it's surprising that they were comfortable turning to an AHL guy who struggled in limited NHL time last season. Both of the Vegas goals in this one were scored by defenseman Shea Theodore, his seventh and eight goals of the season. Theodore now has a new career high for goals, validating his seven years and $5.2 million cap hit. Theodore will be a fixture in the Vegas lineup for years to come. He is a young, dynamic defenseman that will be a bargain for years at just $5.2 million per season. Theodore's second goal, from Ryan Reaves, was a nice slick wrister off the inside of the post, past Petr Mrazek. Nino Neiderreiter, Brett Pesce, Jordan Martinook, all-star Sebastian Aho, and Justin Faulk (EN) scored for the Hurricanes. Mrazek secured the win for the Canes, making 23 saves on 25 shots. With the loss, the Golden Knights slip to a record of 29-20-4 while Carolina improves to 25-20-6. The Golden Knights remain 10 points ahead of the Vancouver Canucks, for third place in the Pacific Division. Tonight, the Golden Knights will be back in action against the Florida Panthers, presumably with Fleury in goal. Florida has had their share of struggles this season and Vegas will be looking to snap their current three-game losing streak. Expect a hungry, motivated Vegas team as Coach Gallant said the team "did not play well enough to win", last night. Florida also played last night, losing 4-1 at home at the hands of the Nashville Predators. Roberto Luongo tended goal, meaning Vegas will likely see James Reimer in net. Florida's newest player, Derick Brassard may not play, as he has been out (in Pitt) with an upper body injury. Puck drop is 4pm Pacific Time. Be sure to follow me on Twitter (@VGK_Buzz) for up-to-date news, analysis, and observations!